Buy Cheap Umarex 2291002 P99 Olive .43 Caliber Paintball Marker|ReplicaAirguns.ca | New Website! 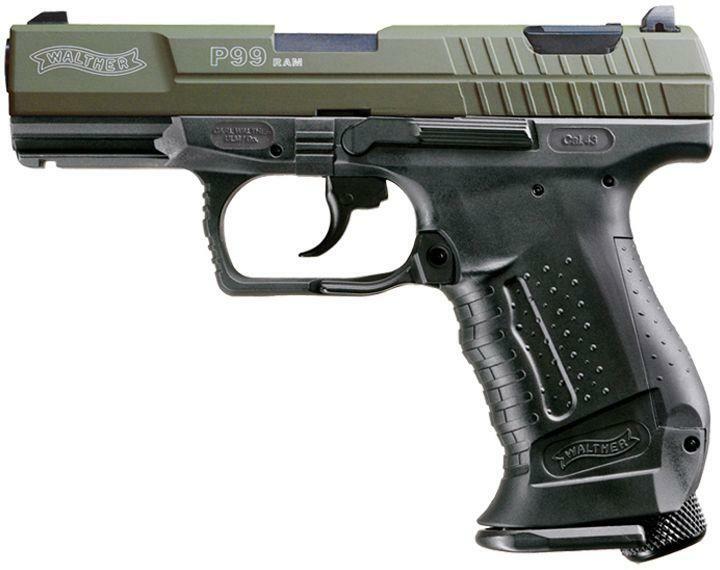 LOOK FOR the Unique Lines and Distinctive Shape of the P99 replica as a TRADEMARK of Walther. The Walther P99 Real Action Marker Paintball pistol is the ultimate in reality training. RAM products are replicas of the actual firearm and utilize clips containing either .43 caliber paintballs or .43 caliber rubber balls. Rubber balls are commonly used for military, police, or other authority training. This P99 RAM is powered by one 12g CO2 capsule. It looks, feels and shoots with great accuracy just like the real P99 for virtual reality paintball. Comes in a foam-lined, black, hard plastic gun case. Additional .43 caliber magazines are available. RAM markers are used extensively in milsim (military simulation) and police force training situations. Available in all black, black with silver slide, black with blue slide, or black with green slide.